TPC Professional Edition and TPC Premium Edition now import/export Google Earth KMZ files. 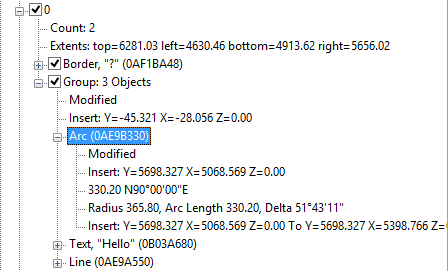 KMZ files are basically zipped up KML files. They save space and allow users to package more data in a nice portable format. Exporting KMZ is just as simple and just as familiar as exporting KML data from Traverse PC. You can export all the same data, traverses, points, and surfaces. Importing KMZ data is easy. KMZ files that were originally exported by Traverse PC can easily be imported back in. Legends can have multiple columns now. This gives you more flexibility in organizing your tables and other drawing entities into clean and good looking drawings. Double click the legend in any drawing (even a drawing from a previous version of TPC) to display the Legend dialog. You’ll see new fields for the number of columns and the column spacing (distance between columns). 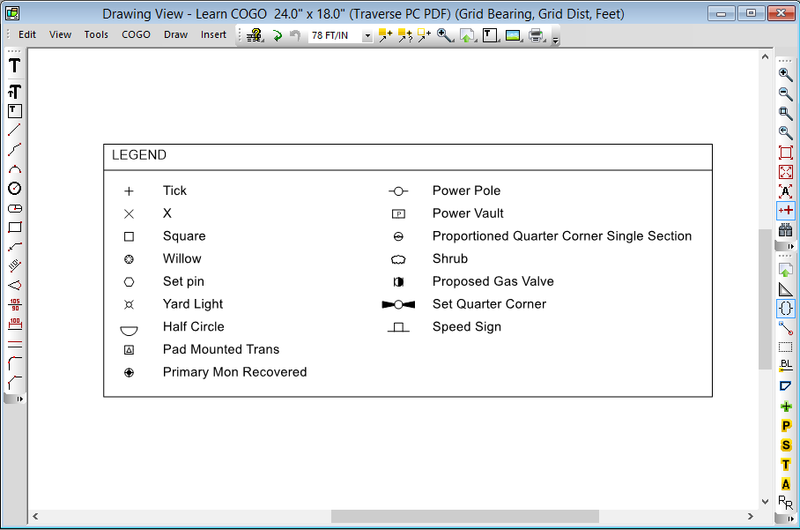 The fields you set in the location tab in traverse properties can now be rendered in the drawing view via the traverse drawing settings. This helps you label lots with useful information related to the lot’s tax identification, owner, building number, etc. TPC creates a multi-line text object with all the location data. Drag-n-drop it where ever you like on the parcel. If you rotate or translate the lot later on, the parcel text stays with the lot – just like you would expect. When you create parcel locations, TPC lets you select a default location of Upper Left, Lower Left, Center, etc. It places the text there and sets the text justification to match (like the labels shown here). Want it in a different location? Just edit the parcel location properties and select a different location. We sped up the Drawing Data Manager by populating the listed nodes ONLY when you expand them. Seems like a pretty simple thing, and it was. But if you are working with a large drawing, it will make your work a whole lot faster. Entities inside of the group are now listed under the group when you expand the node in the Drawing Data Manager. Not only do you get to see exactly what is in the group, but this is a great way to edit the group data. Select any object node in the group, like Arc / Text / Line shown here and choose Properties. TPC opens the dialog for that object, letting you change whatever you want. The next drawing regen places your group edits into the drawing. 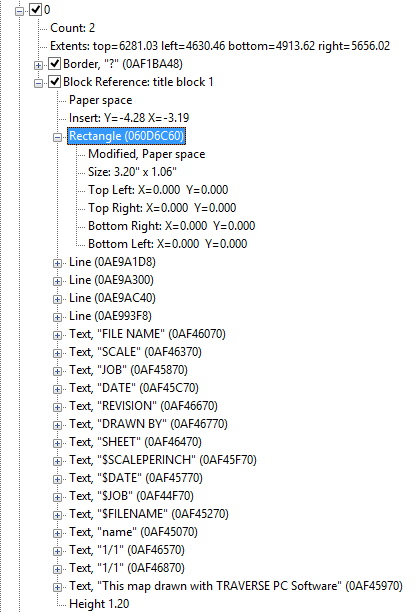 When you insert a block into a drawing Traverse PC lists that block under the corresponding layer in the Drawing Data Manager. Now the Drawing Data Manager lists all the entities contained within that block. This is a great way to get information stored within a block. Just find the block node on it’s layer and expand it. The vertices of a polyline are now listed under a polyline in the Drawing Data Manager. Currently, this is the only way to get a list of the vertices in a polyline. You can see exactly what the coordinates and bulge are for each polyline segment. You can now store Point Codes in point descriptions or attributes. For years, TPC has provided point codes to help you turn your field data into a finished product. 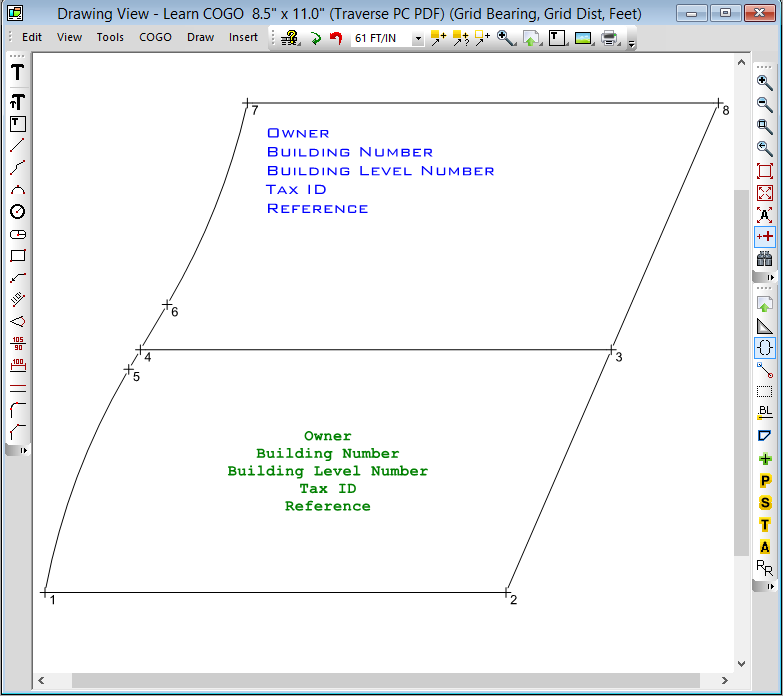 TPC sorts points into traverses using their point codes and can copy traverse drawing settings from the codes to their new traverses, automatically defining symbols, line types, colors, labels and lots more. In almost no time at all, your map can be partially drawn just using point codes. Until now, TPC only looked for point codes in point descriptions. 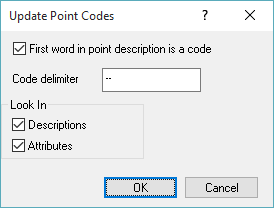 Now, with TPC 2015 R2, TPC can look for point codes in point attributes as well. This is important for those of you sharing data via LandXML files which use attributes and with some data collectors that store codes in attributes instead of descriptions. Special Offer: Purchase the TPC Connection for your Edition and, receive free Updates & Agile Releases for 2015! To qualify, you must own TPC Desktop v13.0 – v15.0. We will send you a link to download TPC Desktop 2015 R2 and all of its Agile Releases automatically as they are released. Take a look at our Learning Center to see what you’re missing out on if you pass up this deal!